OCT 12 – We arrived in Cleveland in the wee morning hours. Due in at 12:59 AM, the train was an hour and a quarter late. The approach was beautiful, over a bridge suspended just above an inky Cuyahoga River surface reflecting the colorful lights above. The chipper good humor of Janet, who met us at the station, belied the lateness of the hour. Our subsequent impromptu tour of the city included a 2:30 AM visit to the site of Occupy Cleveland, where 40 or 50 people were bedded down in a close-knit tent city. A couple of middle-aged African-American men waved at us from their sleeping bags. A few people stood on the sidewalk chatting amicably with the five uniformed police on site. Janet assured us that the police were there as friends; their own salaries are on the chopping block so they have generally been supportive of the occupation. A young man with unruly hair walked over and leaned in for a quick introduction to Brian. Janet continued to orient us as we made our way over to the Cleveland Heights home where we would spend the next four nights (thank you Peggy!). Brian and I woke up to rain, feeling well rested after sleeping in (still on Pacific Time), but a little out of sorts because the power was out. We were we determinedly traveling without cell phones and there was no working clock to be found anywhere. Our own little travel clock had apparently been knocked off track by being squished into my overloaded backpack (no way it was 5:30, AM or PM!). It took a walk in the rain to find out from neighbors why the power was out (trees being trimmed) and what time it was (close to 1:00). After updating Brian I ventured out again for coffee and to rent a car for two days so we could at least get out to do some computing during the morning hours, as our host’s router had broken down just before our arrival. 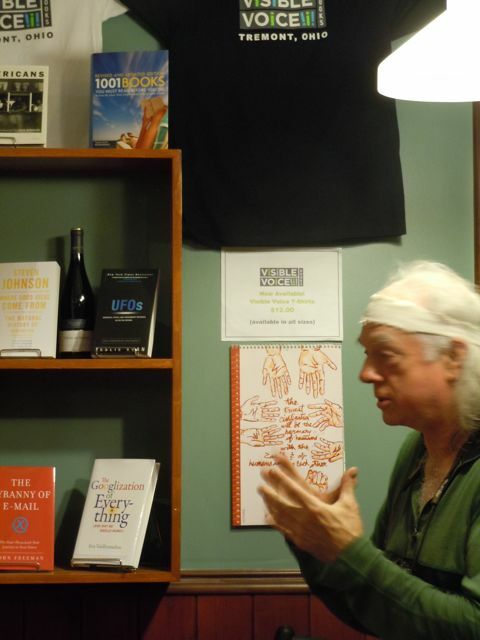 Brian’s premiere East Coast book talk was held that evening (Wednesday, Oct. 12th) at Revolution Books in Cleveland Heights, located at the corner of Mayfield at the lower end of the Coventry Road business district. As we approached the figures milling out front of the store, a tall thin man wearing a ball cap and spectacles greeted us. “Do you remember me?” he asked Brian. Turns out it was Brian’s ex-brother-in-law from West Virginia, the ex-husband of one of the sisters of his first wife. They hadn’t seen each other for 32 years; he had learned about the event through one of Brian’s facebook friends. 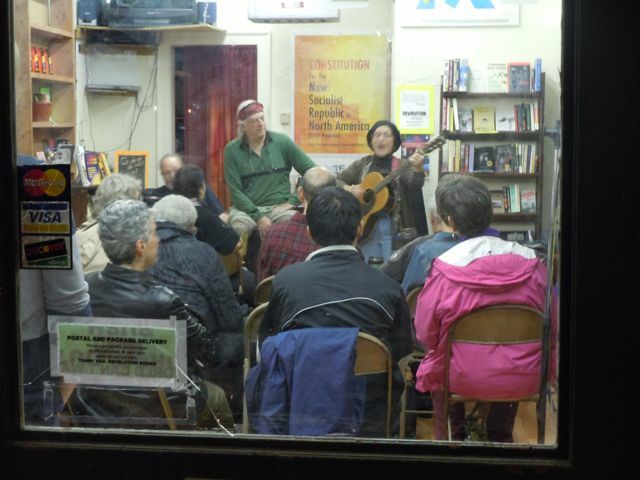 The small space was filled by starting time and Evie Morris warmed up the crowd with a song as volunteers squeezed in a few more folding chairs. I counted 25 people and about half that many book were sold—not a bad kickoff. We met a few of Cleveland’s stalwart activists that evening, including MJ Muser, a wonderful organizer who was integral in setting up his three Cleveland events, all of which she would attend. This C-Town leg wouldn’t have happened without her! OCT 13 – Early the next afternoon, MJ picked us up with Mike Fagan, our volunteer driver for the day. The first destination was the Amtrak station, where we hoped to pick up our tickets for an early morning departure on Saturday. We wound our way from Cleveland Heights through Little Italy, around museum row, and made a quick stop at the lakefront (Lake Erie that is) on our way downtown. 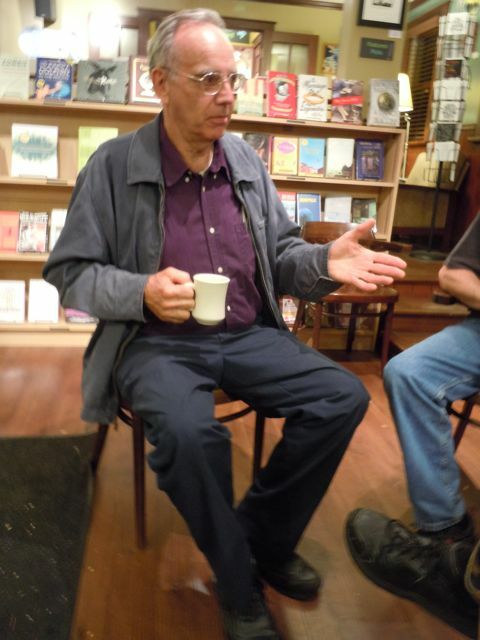 All along the way MJ pointed out historical landmarks, festival locations and other cultural attractions, and entertained us with stories about local political actions and Cleveland activists. Mike’s valiant effort to get us to the Amtrak station turned out to be a wild goose chase, as the station is only open from 9:30PM to 1:00PM. 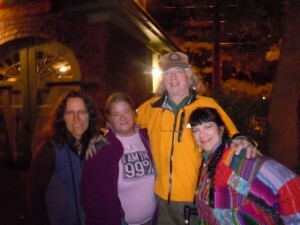 So we moved on to Occupy Cleveland, where we spent a lovely hour hanging out and chatting with fellow 99ers. We learned that the occupation was small but stable, with numbers fluctuating every day. It was a fairly diverse group. Some people were working during the day and sleeping there at night. General assemblies and small marches were happening every day at regular times. Plentiful donations of food and drink were evident and there was even a roll-your-own tobacco station. The Cleveland occupation was receiving regular media attention, from independent videographers as well as professional journalists. One young spokeswoman, who told me she quit her day job to help organize, flashed the BBC t-shirt she got when Occupy Cleveland was featured on the international network’s “Have Your Say” call-in radio show. We caught an early dinner on our way to Visible Voice Books in the Tremont neighborhood. The cozy space was filled with about a dozen people. 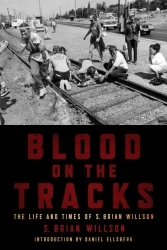 At least half of those bought a copy of Blood on the Tracks, and a quarter (including me) enjoyed the wine-tasting that was offered, a benefit for Veterans For Peace (VFP). I also enjoyed browsing the great selection of other books on display, collecting ideas for future reading. 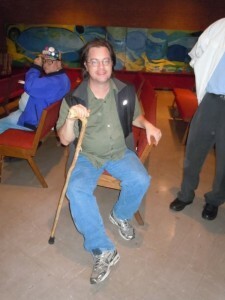 In the audience were Art Dorland and Mike Ludwig from the local VFP chapter. Art was one of our unofficial hosts, having received and delivered a box of books for this evening’s gig and volunteered to take us to the Amtrak upon our departure. The two vets lingered afterward to drink coffee and visit with Brian and I before giving us a lift back to Cleveland Heights. OCT 14 – We started our day with hot cereal, coffee and computing before hooking up with Cleveland rockstar activist Leatrice Bard Tolls, who was basically at our beck and call for the afternoon and charged with getting us to the evening gig on time. We returned our rental car around 2 o’clock, and then Lea took us to Tommy’s, a local institution with an extensive menu listing 101 different combinations of a few basic ingredients, i.e. baba gannoush, hummus, veggies, cheese and bread, and a few different kinds of meat. There we met up with Charlie Mosbrook, local folksinger extraordinaire. I’d been noticing Charlie’s CDs and open mic advertisement over at Phoenix coffee for the past three mornings and knew he would be singing at Brian’s book talk that night. Charlie was an Ironman triathlete and marathoner until a debilitating spinal cord injury changed his life in 2010. Despite this devastating physical setback, Charlie managed to channel his adversity into a burst of creativity when he found that his singing and songwriting abilities remained very much in tact. It was interesting to watch Charlie and Brian (whose pinched nerve pain had made a nasty comeback after he overdid in Chicago) slowly making their way to Lea’s van together, both walking slowly and painfully with the help of their canes. 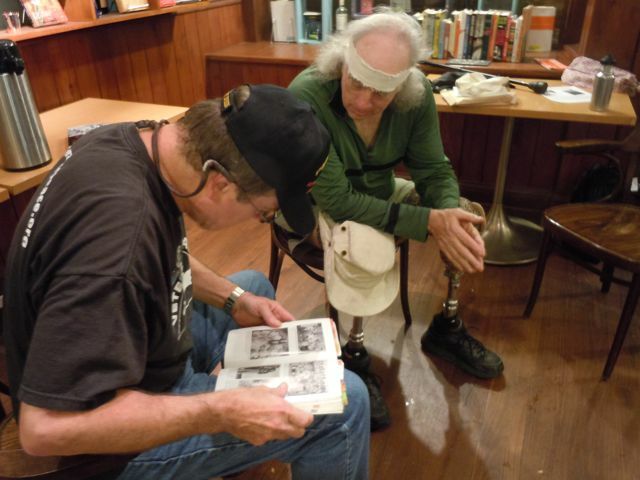 The two enjoyed getting to know each other during a relaxing couple of hours at Lea’s place while she and cooked up a few dishes for the evening’s potluck before heading over to Paul’s Community Church in Ohio City for Brian’s third and last Cleveland gig. 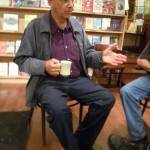 This entry was posted in Book Talk, Book Tour, East Coast leg, Fellow Travelers, Occupy and tagged Charlie Mosbrook, Cleveland, Evie Morris, Revolution Books, Visible Voice. Bookmark the permalink.